Did you know that a jigsaw puzzle is an activity that exercises both sides of your brain and improves memory, cognition and creativity! 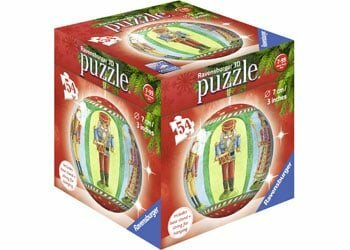 Our beautifully crafted Christmas jigsaw puzzles are all made either in Germany or in the US with high quality interlocking pieces on thick board. 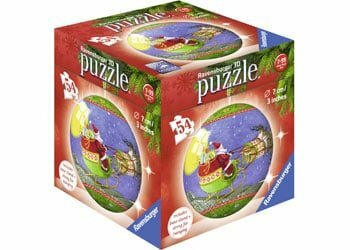 We have a range of different sized jigsaw puzzles to suit all ages and abilities making these Christmas puzzles the perfect Christmas gift for that hard-to-find person or an educational and fun activity for kids in the school holidays. 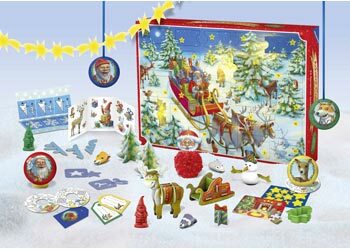 This beautifully crafted 550 piece Christmas Jigsaw Puzzle is a fun and educational activity the whole family can enjoy! The Perfect activity for the kids in the lead up to Christmas and also makes an easy Christmas gift for both kids and adults. 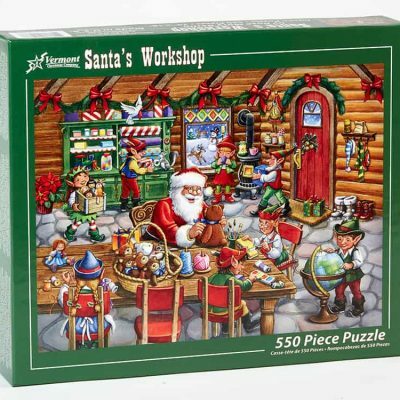 The Santa's worshop jigsaw puzzle features the magical illustration Santa and his elves busily preparing toys in the North Pole toy factory. The beautiful illustration features artwork by artist and illustrator Mary Rose Berlin. The puzzle is crafted from recycled materials in the US and each piece is produced on thick quality board with fully interlocking and randomly shaped pieces making if perfect for mounting and framing once completed. Puzzle includes 550 pieces and measures 61cm x 46cm. 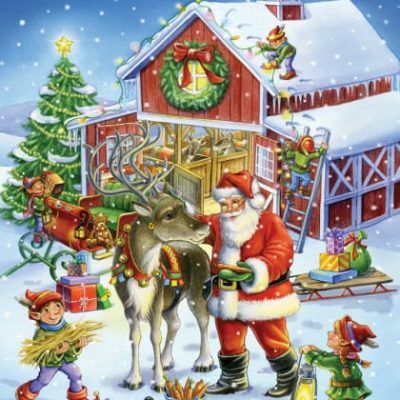 This is the ultimate kids Christmas jigsaw puzzle! 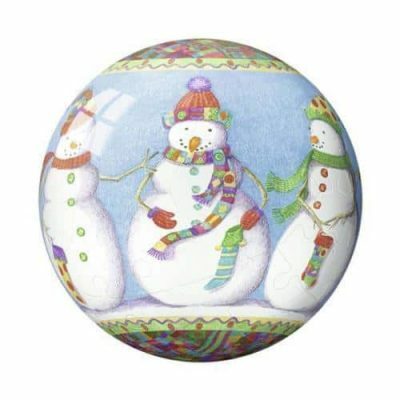 This double-sided puzzle features both a coloured side and a black and white side. Complete the colored side using the image included in the box as a guide. Once the puzzle is completed, turn it over to the black-and-white side. Then enjoy coloring the puzzle! The surface is suitable for pencils, crayons or markers.. The Perfect activity for the kids in the lead up to Christmas and also makes an easy Christmas gift for both kids and adults. 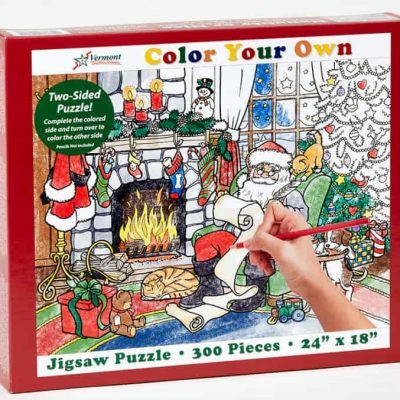 This jigsaw puzzle features Santa in his North Pole home compiling his naughty and nice list. The puzzle is crafted from recycled materials in the US and each piece is produced on thick quality board with fully interlocking and randomly shaped pieces making if perfect for mounting and framing once completed. The beautiful illustration features artwork by artist and illustrator Mary Rose Berlin. 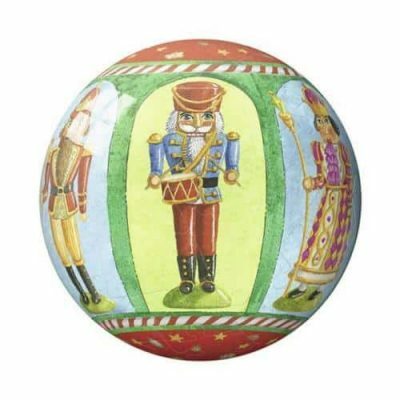 Puzzle includes 300 double-sided pieces and measures 61cm x 46cm. 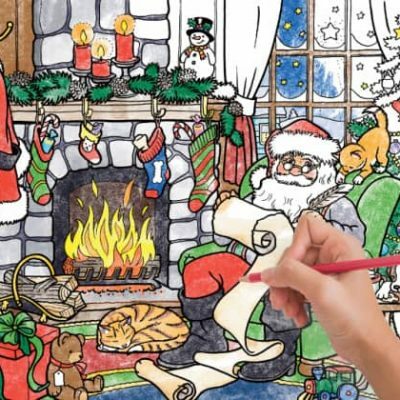 This beautifully crafted 1,000 piece Christmas Jigsaw Puzzle is a fun and educational activity the whole family can enjoy! 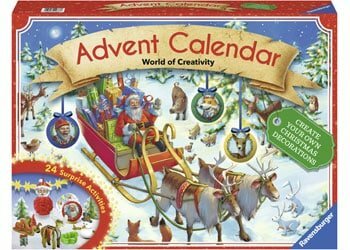 The Perfect activity for the kids in the lead up to Christmas and also makes an easy Christmas gift for both kids and adults. 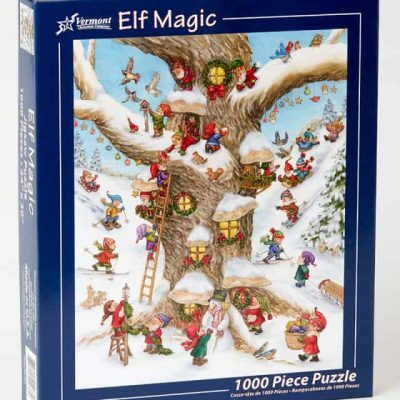 The Elf village jigsaw puzzle features a magical North Pole scene of Santa' elves preparing their treehouse home for Christmas celebrations. The puzzle is crafted from recycled materials in the US and each piece is produced on thick quality board with fully interlocking and randomly shaped pieces making if perfect for mounting and framing once completed. Puzzle includes 1,000 pieces and measures 76cm x 61cm. 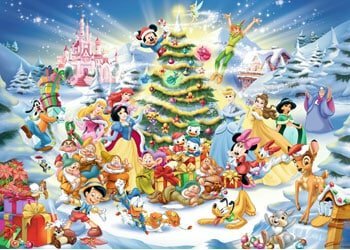 All your favourite Disney characters in this 1000 piece Ravensburger Christmas Eve Jigsaw Puzzle! Featuring the entire Disney Family: Disney Princess, Donald Duck, Mickey Mouse, Peter Pan, Pinocchio and loads more! 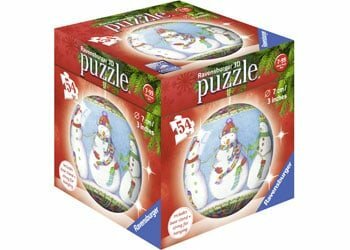 Ravensburger Jigsaw puzzles are made in Germany and use the Softclick-Technology for optimal fit pieces that are made from high quality board. 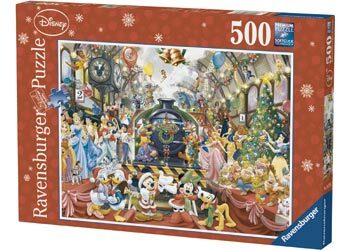 This jigsaw puzzle is part of the World of Disney Ravensburger collection and is a fun activity the whole family can enjoy this Christmas! Puzzle includes 1000 pieces and measures 70cm x 50cm. 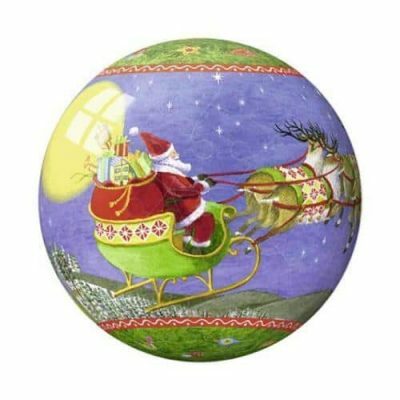 See our full range of Christmas jigsaw puzzles here. 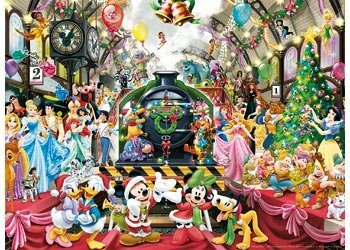 All your favourite Disney characters in this 1000 piece Ravensburger Christmas Train Jigsaw Puzzle! Featuring the entire Disney Family: Disney Princess, Donald Duck, Mickey Mouse, Peter Pan, Pinocchio and loads more! 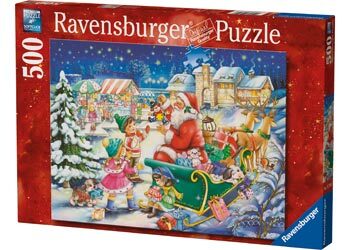 Ravensburger Jigsaw puzzles are made in Germany and use the Softclick-Technology for optimal fit pieces that are made from high quality board. 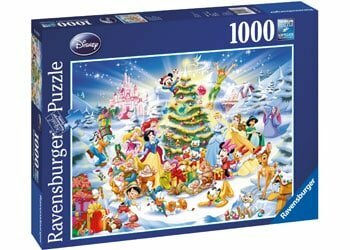 This jigsaw puzzle is part of the World of Disney Ravensburger collection and is a fun activity the whole family can enjoy this Christmas! Puzzle includes 500 pieces and measures 49cm x 36cm. 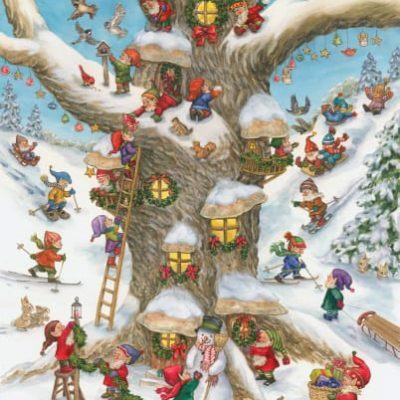 See our full range of Christmas jigsaw puzzles here. 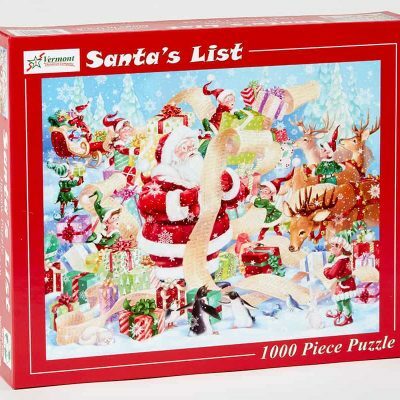 This beautifully crafted 1000 piece Christmas Jigsaw Puzzle is a fun and educational activity the whole family can enjoy! 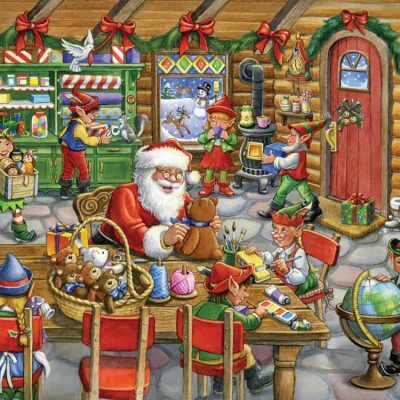 The Santa's List puzzle features the bright and joyful scene of Santa preparing his naughty and nice list with his Christmas Elves. The puzzle is crafted from recycled materials in the US and each piece is produced on thick quality board with fully interlocking and randomly shaped pieces. The beautiful illustration features artwork by artist and illustrator Randy Wollenmann. Puzzle includes 1000 pieces and measures 76cm x 61cm. 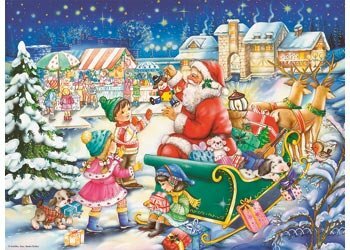 This beautifully crafted 1000 piece Christmas Jigsaw Puzzle is a fun and educational activity the whole family can enjoy! 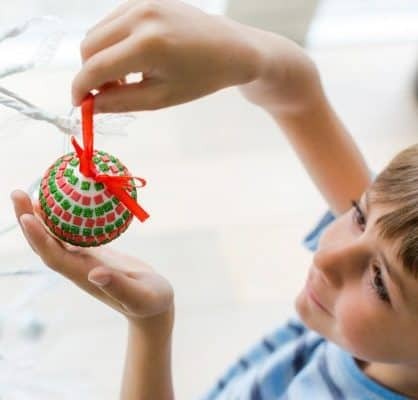 The Perfect activity for the kids in the lead up to Christmas and also makes an easy Christmas gift for both kids and adults. 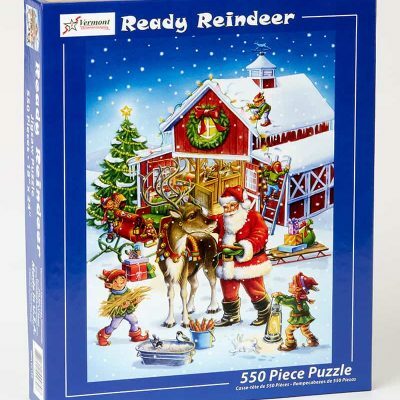 The Ready Reindeer jigsaw puzzle features the magical North Pole scene of Santa preparing his reindeer for the big annual journey with his Christmas Elves. The puzzle is crafted from recycled materials in the US and each piece is produced on thick quality board with fully interlocking and randomly shaped pieces making if perfect for mounting and framing once completed. The beautiful illustration features artwork by artist and illustrator Mary Rose Berlin. Puzzle includes 550 pieces and measures 61cm x 46cm.